THERE ARE lots of buyers looking for a great home, but it still takes effort to sell your home. Sad news for home sellers: we are still in a buyer’s market (in most areas) and not every home sells. When they do sell, they don’t always generate the price the sellers were hoping for. When a home is lingering on the market for several months, it’s easy to get frustrated and disappointed. The truth is, every home will sell AT THE RIGHT PRICE, with very few exceptions. WHEN I work with first time buyers, they typically have around 60 homes to choose from, in their price range, within a radius of their desired home base. Most buyers look at less than ten of them in person, and they usually write an offer on one, with a second choice in mind. That means that we first determine price, size of home and location, and then buyers spend time on the computer with me first. They base their entire decision on what homes to visit in person by what they see on MLS by reviewing listing photos and captions, desired location, and features that add value. They will only see about 16% of the available homes in person. And they will compare those homes AGAINST EACH OTHER. KEY POINT: It doesn’t matter to the buyer what the recent closed comps say your home is worth per square foot. In order to get a sale in any price category, your home must be better (in the buyer’s viewpoint) than all the other available homes in order for them to write an offer on it. That means that your home must go on the market beating all other homes in your price category in terms of value, condition and location to win the prize: an offer. FEATURES THAT ADD VALUE to buyers include upgrades like tile, granite, refinished hardwoods, appliances, fresh paint and lighting, and bonus points are gained with a basement or garage, fenced yard, age of major components like electrical, roof or HVAC. 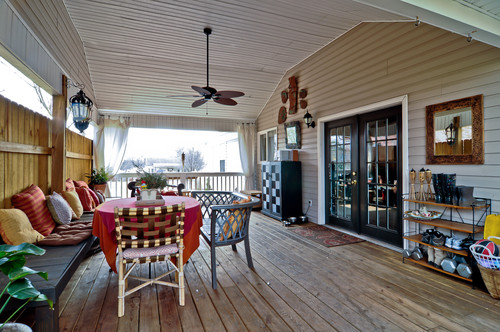 In smaller homes, an open floor plan and an outdoor entertaining area, like a patio, deck or screened porch, will expand the space for entertaining. CONDITION IS ALSO A KEY FACTOR. It is okay to sell your home "as is", but it must be in better condition or larger or have more features than other homes at your price point, or you will need to lower your price to match up with a buyer. Sometimes it’s not about your home’s condition or features, but its LOCATION (perhaps the streets getting to yours have abandoned or neglected homes) or your immediate neighbors have deferred maintenance or junk piled high in front and rear yards, neglected yards, weedy broken fences. I have turned down listings because of the hoarder next door whose collection of yard art had become mountains of rusted metal woven with weeds. The seller wanted a number that wasn’t realistic based on the window, street and yard views that a potential new homeowner would be subjected to. Yes, it’s not fair, but your price will go down because the perceived value of the property goes down in the eyes of the beholder. Yes, even with granite counters and refinished floors. Your home could be pristine, but its location is not. That neighbor across the street could be costing you big money. You have heard that LOCATION is a powerful selling point. That’s not just about the zip code, it’s also about the daily quality of life. IF YOUR AGENT HAS THE BASES COVERED with lots of good photographs in a well written listing, you provide accessibility to show the home (i.e. : accepting all appointments, whenever possible), you know your home is presentable and smells good for showings, your listing is on all the syndicated websites and there’s a sign in the yard (if permitted by HOA); then it all comes down to PRICE. If you cannot afford to improve the condition or features, and you can’t stomach having a block party to clean up your street and help neighbors make repairs, then you can either rent your home out, stay put, or list at a the price that beats the competition. Your pricing must attract a buyer who will see your home as the best one they can afford, so that they will be willing to overlook the neighbors’ messes. Sher Powers is the owner and managing broker of Urbane Residential Specialists. She has worked with several hundred buyers and sellers, from serious investors to first time home buyers, and loves the challenge and adventure of finding the perfect property for her clients and finding the perfect buyer for her listings. For more information and timely blog topics, visit Urbane at UrbaneNashville.com.